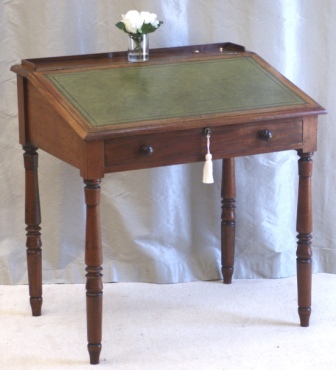 Superb Small Antique Writing Desk in Mahogany. William IV period. Stamped in two places by the maker, Thomas Mash, 102 Wardour Street, London. (Thomas Mash was in business at this address from 1829 to 1839). The writing slope having a tooled green leather writing surface inset. Dummy drawer with twin turned wooden handles. The whole on finely turned legs. Brass working lock with key. Twin ink well recesses with lids with ivory handles. Plain interior with support to hold the writing slope. An excellent historic piece of furniture in very good order.